Parties to the United Nations Framework Convention on Climate Change (UNFCCC) have agreed that seven safeguards should be promoted and supported when undertaking REDD+ activities. These safeguards were agreed at the UNFCCC Conference of Parties (COP) in Cancun in December 2010 and are known as the ‘Cancun safeguards’ (Decision 1/CP.16 Appendix 1 Paragraph 2). Furthermore, it was also decided in Cancun in 2010 to request developing countries to establish a system for providing information on how these safeguards are addressed and respected throughout the implementation of activities (Decision 1/CP.16, Paragraph 71 (d)). These have become known as ‘Safeguards Information Systems’ (SIS). At the UNFCCC COP the following year in Durban in 2011 it was decided that countries must provide a summary of information on how all the safeguards have been addressed and respected (Decision 2/CP.17 Paragraph 63 and 64). In Warsaw in 2013, the COP decided that the summary of information on safeguards should be included in national communications that are submitted every four years to the UNFCCC. In addition, the country could voluntarily submit the summary for posting on the UNFCCC web platform at any time (Decision 12/CP.19, Paragraph 2 and 3). In addition, the decision on finance for REDD+ in Warsaw determined that the summary of information on how safeguards are addressed and respected is required prior to results-based finance (Decision 9/CP.19 Paragraph 4). Based on experiences from countries participating in the REDD+ SES Initiative, approaches to developing and implementing SIS vary between countries but generally comprise the six key elements. Further information on key questions for the design of SIS and lessons learned from country experiences are provided in the factsheet ‘Lessons learned for credible and effective safeguards information systems’ (November 2014). 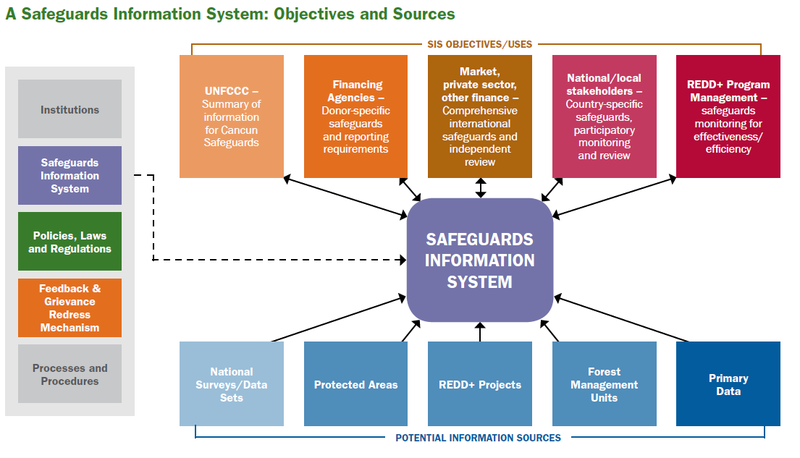 The safeguards information system can serve multiple objectives at different levels including reporting internationally for results-based financing, and providing information within the country to improve the REDD+ strategy (adaptive management) and to build and maintain stakeholder and political support for REDD+. 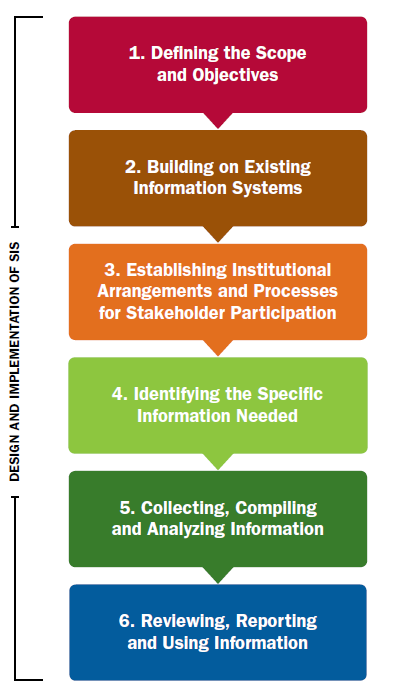 The objectives for the SIS and the uses of the information need to be defined early in the development process, since they will affect the design.